Maples Repertory Theatre, located in historic downtown Macon, Missouri, is an Equity theatre. Because of Maples Rep, Macon becomes a temporary home to professional actors, directors, designers, and technicians reigning from New York to California from June to December. Maples Rep has been bringing professional theatrical productions to North Missouri since 2004. Men in the Parish Basement? What’s a church lady to do? “Rise Up O Men” gives the gents a chance to shine in the latest installment of the Church Basement Ladies musical comedy series. 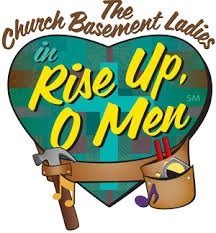 Sixth in the Church Basement Ladies Series, “Rise Up, O Men” is a brand new musical comedy featuring the men of the church and your favorite church basement ladies who serve them. As these hardworking farmers discuss their scrap lumber piles and benefits of weld versus solder, they unintentionally disrupt the order of the kitchen. But that’s what happens when you let the rooster in the hen house.